The Motorcycle Development Program Participants Association (MDPPA), which comprises motorcycle manufacturers Honda, Kawasaki, Suzuki, Yamaha, and Kymco, breached the 1 million sales mark for the first time as it capped off 2016 with a 34 percent year-on-year (YoY) sales growth. Reporting an all-time sales high of 1,140,338 million motorcycles in 2016, MDPPA has exceeded its initial 952,570 unit and 12 percent sales growth forecasts for the year, posting the highest growth among members of the Federation of Asian Motorcycle Industries (FAMI), which include six other motorcycle associations from Indonesia, Japan, Malaysia, Thailand, Taiwan, and Vietnam. MDPPA’s 2016 sales growth is attributed to the robust motorcycle demand in the first half of 2016. The group’s midyear motorcycle sales reached 544,699 units, significantly higher than its 382,568 midyear motorcycle sales in 2015. With demand for moped motorcycles hitting a new all-time high, the category accounted for the lion’s share of MDPPA’s total motorcycle sales in 2016. The total moped motorcycle sales reached 418,043 units or 37 percent of the aggregate motorcycle sales. The next leading sales driver was the business motorcycle category, which accounted for 32 percent of total motorcycle sales at 368,270 units. Meanwhile, the 274,104 unit sales of automatic transmission posted the highest growth among the categories, with 51 percent increase from 2015. The robust in the category sales contributed greatly with the total sales in 2016. Banking on a remarkable year in 2016, MDPPA is upbeat and sees a positive outlook for the motorcycle industry in 2017. The group is optimistic about replicating, if not surpassing, its 2016 sales growth this year with a conservative target of 12 to 15 percent uptick. MDPPA credits the local motorcycle industry’s 2016 growth to an increase in private consumption, prevalent use of mopeds for personal purposes, introduction of new models, higher foreign exchange rates and remittances, and traffic congestion in metropolitan areas. The same factors will continue to fuel the industry’s performance this year. 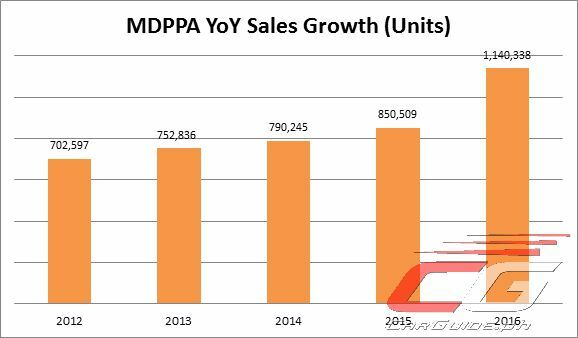 MDPPA’s 2016 performance has definitely set the momentum for hitting an even higher sales mark this year. MDPPA expects motorcycle sales to accelerate along with increasing demand for mobility especially in major cities.